Pengguna internet, terutamanya pengguna smartphone kebiasaannya hanya “scan” konten yang disajikan di newsfeed/blog dan mencari keyword-keyword penting untuk meneruskan minat membaca. Jadi sekiranya mereka nampak perenggan yang tiada spacing seperti perenggan ini, ada peluang mereka tidak akan baca (melainkan mereka minat betul dengan penulisnya). Perenggan yang tiada spacing juga nampak sibuk dan kelam kabut. Saya sendiri pening baca perenggan ni. Kalau saya nampak perenggan macam ini di FB saya tidak akan baca haha. Rugilah kalau perenggan kita panjang dan tiada spacing macam ini. Rasa macam tembok. Hmm. Sebaiknya artikel / post mempunyai perenggan yang pendek. Mungkin satu ke dua ayat sahaja. Macam ini. Back in June 2016, I was looking for a digital marketing guy to take over our FB & Google Ads responsibilities. But it’s difficult to gauge a person’s skills in digital marketing by just doing interviews. So I had them do a case study, to be submitted on the same day. It has been close to a year since I wrote Making TheLorry.com: A journey from idea validation to being VC-funded. As 2016 comes to a close, this article will highlight our hits, misses and key learnings for upcoming entrepreneurs. Fresh from receiving our Series A funds (USD1.5 million), Chee and I had dinner at Chilli’s early January 2016 to discuss top-level strategy and our plans for the year. Quite simply, the goal was to grow x% by December 2016 in terms of revenue, number of bookings and gross profit. We also discussed division of labour – I was to handle our bread-and-butter B2C business while Chee took on the fast-growing B2B department. Being an entrepreneur is not easy. There’s so much going on during the week you just need a “release” during the weekend. Personally, I watch a lot of movies & shows just to do that. Here are some of my favourites that will leave you feeling inspired! My all-time favourite. Watch Gordon Gekko’s wheeling and dealing and the persistence of Bud Fox in getting a meeting with Gordon. Favourite scene: The BlueStar Airline scene when they pumped the share price up, brought it back down and the commotion that followed. Yes, this show is about drugs and crime. But Narcos is also an amazing depiction of entrepreneurship – how to build a network, formulating profitable strategies and thinking big. On 19th January 2016, we announced our USD1.5 million Series A funding round. This is what happened behind the scenes. When I wrote this post about TheLorry’s story on idea validation on Nov 2014, we were still basically a two-man team (two-man and a half if you count a freelance developer). I was doing mostly customer service & operations work whereas my partner and co-founder Chee Hau was in charge of marketing & sales. As we started to get traction, we were convinced that our idea is sufficiently validated and it was time to put in more resource to take it to the next level. Since tech is our core competency, we felt we should get a developer on board full-time. Freelance won’t work. Our credit cards were already maxed out so we needed to look for outside money in order to start hiring. We began to actively meet potential early-stage investors to pitch our fledgling startup. 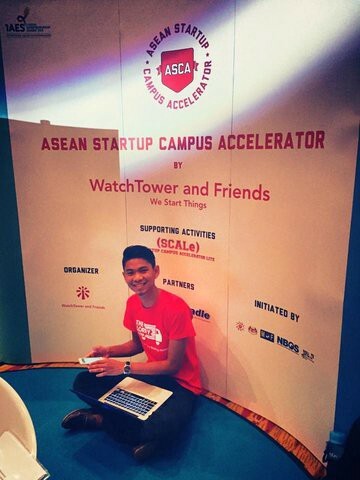 One of them that we pitched to was a KL-based angel investor. Meeting went well but I suppose we didn’t impress him enough. Ok, so you’re driving back home after a mamak session with your friends. As you’re about to turn into the Kota Damansara exit of NKVE you suddenly get a moment of epiphany — you have an idea for a really cool website that hasn’t been done before, one of a kind. You speculate that this website will go really, really far. It will make you billions of dollars after you exit and get acquired by Google. You can imagine yourself swimming in a pool with your future wife Ayda Jebat full of RM50 notes already. After telling few of your friends about it (and always by starting the conversation with — “Eh, this is a secret ah, don’t tell anybody. I don’t want people to know about this and copy.”) you find yourself a co-founder who believe in your vision. The both of you then start building wireframes on how the website would look like. You identify your target market and have a marketing plan in place. Since you worked in a management consulting firm before, your business plan slides exceed 30 pages. None of you can code, so you source for a developer to build the really cool website. After a few phone calls and emails you finally found a freelancer guy who you like and has a good portfolio of clients. Since you don’t want the website to look incomplete and to have ALL the features you want, the quote for the website came up to RM100,000 (50% upfront) and 6 months of development time. But you believe in the idea. You believe that it will be worth billions. So what’s RM100,000? You will be known as the guy who pumped only RM100,000 to build an empire worth billions. It’s lunch time and two coworkers (both running their own exciting startups), Chris and Rizal are trying to figure out where to eat (a common Malaysian problem). Chris: Who’s gonna Kaodim lunch today? Rizal: You hutang iMoney bro. Of course you gonna buy today. Chris: WTF, where got? Why all of a sudden like MaGIC I owe you money? Rizal: Please bro. How come you forget such things. Up to today, you owe me1337 Ringgit Plus man. Remember you used my credit card to buy AWS Credits. Chris: Oh ya hor I totally forgot about that. Oklah today’s lunch on me. Can you Recomn a place to makan? Rizal: Now Offpeak hours, should be no jam lah. Ara Damansara there can? Chris: Cool, I got a Baucar for a restaurant there. Got good reviews on Hungry Go Where also. Daripada segi pemasaran pula, Google AdWords membolehkan kita untuk mengiklankan produk bagi kata kunci (keyword) tertentu. Sebagai contoh, sekiranya kita buat bisnes servis aircon, kita mungkin akan mengiklankan servis kita apabila pelanggan menaip “aircon service” di google. Masalahnya, sekarang ini sudah terlalu ramai orang mengiklankan produk mereka di Google AdWords, terutamanya untuk kata kunci umum. Kita perlu bersaing dengan orang lain untuk memastikan iklan kita berada di atas ataupun sekurang-kurangnya muka surat 1. Namun begitu, bukan semua pengguna akan menaip “aircon service”. Sekiranya mereka tinggal di Mont Kiara, mungkin mereka akan menaip “aircon service in mont kiara” untuk mendapatkan butiran syarikat yang beroperasi khusus di kawasan tersebut.